DH has been quite busy in his office these days and during his meetings they normally would invariably eat Pizza from Pizza Hut or a Burger from McDonald’s. Over a period he has developed a hatred for Mc burgers and was after me that he wants to eat homemade Indianised Burgers. Now the caring and obedient wife I am, how could I ignore his demand . Jokes apart I truly love pampering him at times and so decided to innovate a new Patty for the burger. A classical burger basically comprises of a bun cut into halves, a patty which could be veg or non veg, Mayonnaise, cut vegetables. It can be served with or without cheese. To make the burger really tasty and inviting the key ingredient that should be really good is the patty. I always tend to make a healthy and tasty patty and that’s the reason my family loves homemade burgers as the flavours are not repetitive. As I mentioned in the Jackfruit & Red Lobia Salan that Jackfruit is available abundantly these days and I am right now on a Jackfruit spree…the real truth is I was left with some jackfruit after making the curry so wanted to use it in an innovative way . Honestly speaking I was overwhelmed with the result. The burger turned out very tasty and undoubtedly extremely nutritious and healthy to eat. Kids and S loved it and I was all collars up. Squeeze out the excess water from the soya chunks. In the food processor put the soya, cooked jackfruit, garlic, ginger and green chilies and blend to mix. The jackfruit being fibrous needs a binding agent, that role is played by the boiled potatoes, mash them and mix. Mix the chopped onion, all spices, salt to taste, oil and milk. Adding oil and milk in the patty dough makes it more soft and succulent (if one likes a very firm patty do avoid these). Take a tennis ball size portion of jackfruit mix in one palm and shape it like a patty using the other hand. Shallow fry the patty from both the sides. Take due precaution while flipping. Cut the burger into equal halves and lightly toast them on a griddle using oil or butter ( I used oil). Spread mayonnaise(I used eggless, low fat) on the lower half and place the patty over it. Place the sliced onions and tomatoes (one can use cucumber, beetroot too) over the patty. Cut the cheese slice and place over the sliced veggies. Now put the lettuce leaf ( I did not have that so use cabbage leaves) and finally put the other half of the burger and close it. Warm it at 60% microwave for 30 seconds before serving. Press it gently from the top, serve it with tomato and mustard sauce. This can be a very filling meal too. 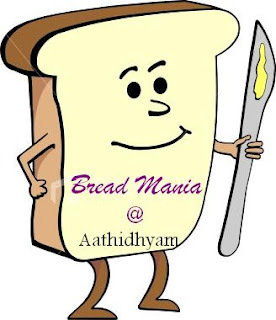 Sending this to Bread Mania hosted by Chaitra at Aathidhyam. 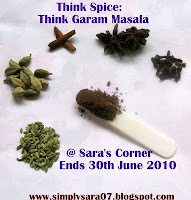 and also to Sara and Sunita’s- Think Spice Think Garam Masala. Sending the burger to my event ‘Only’ Sandwiches, burgers & Panini, guest hosted by Savi-Ruchi. Jackfruit and soya burger is new to me. Bookmarked! Interesting recipe for patty.. The burger looks very fresh and inviting. wow - that looks delicious... would love a bite! Bookmarked.. this looks too delicious to miss it ! Thanks Preeti and Kanchan, do let me know when u try it. I am glad Priti you liked the read and could make u giggle. Soya and JF gravy burgers look wonderfl. That looks absolutely healthy &delicious one. Pari,,burger pattice looks perfect sounds great the pattice you prepared with jackfruit dear.. Loved your cute presentation...your style of perfection and preparation are very fascinating...can't move out of your space....Hats off dear. Burger looks yummy...never seen pattice made with jackfruit..so innovative! Thanks Divya, Sathya, Aruna and Priya. Jay that's so sweet of u to say that. Thanks Parita, wish I could pass u some. Jackfruit and soya, indeed a different combo, but looks very good Pari. BUrger looks healthy and delicious!! Wow wonderful idea pari.. thanks for sharing this.. this is really innovative using raw jackfruit too..
Lovely write up dear..burger is very delicious, healthy and tempting..wonderful pictures.. Very well explained and lovely step by step presentation.Nice pictures.Very creative burgers. delicious recipe. love jackfruit and thats a nice idea of preparing burger with this. the photography is superb and love that white serving plate. Jackfruit and soya chunk burger looks really good. Nice one. My hubby asking to make it, Now i got a recipe. Always admire the way u write, enjoyed reading..Patties with jackfruit and soya sounds very healthy, bookmarked.. Healthy burger. Looks so good. Nice recipe... YUM! What a unique combo! The Burger looks so delicious and loved the clicks! oh wow, what a unique idea for the burger, Pari! jackfruit and soya.. fantastic.. i so want to take a bite out of that delicious burger pic you posted. Lovely home-made burger. Like the idea of using jackfruit. Nice pics too. wow, that burger looks SO good! Interesting recipe..unique combo,healthy also... burger looks too good. Wonderful burger!! The taste must have been great. Thank you Pari for being so patient with me :-p . First of all I would like to say I liked the blog's new look. Very unique combi and innovative burger pattie. Beautiful presentation dear. This is one of the best burgers I have seen around!! burgers can't get any innovative than this! too good Pari. You rock!